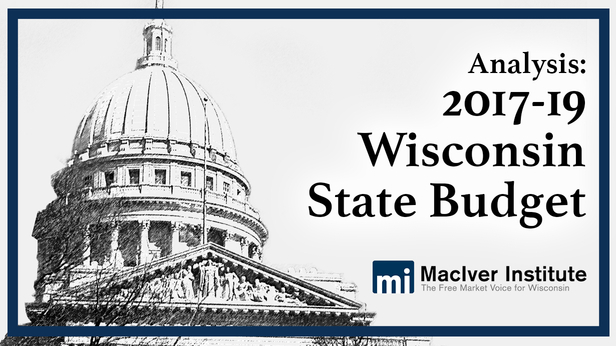 It was 2 1/2 months overdue, but the 2017-19 Wisconsin state budget (2017 Act 59) is now in the books. While the process was delayed and, at times, not pretty, the biennial budget is a good budget. Not a great budget, but a good budget. Any time a government votes to eliminate a tax, that is a significant taxpayer victory. Significant because it happens so rarely. If we eliminate a tax, it makes it more difficult for our government to take our hard-earned money from us in the first place. The only way we taxpayers are ever going to make headway in our effort to limit the size and scope of our government is if we restrain and then reduce the amount of tax dollars going to fund our government. Wiping a tax completely off the books is a positive step towards getting the government we want. The 2017-19 budget signed by Gov. Scott Walker last week eliminates not just one tax but two taxes. Gone, too, is an entire big-government program – the Local Government Property Insurance Fund – that has been a part of state government since the 1900s. The 1900s. We would, at this point, give you some example of what life was like back in the 1900s to drive our point home, but it is so long ago that we can’t. While spending increases in this budget, the final document cuts government positions. The Joint Finance Committee deserves kudos for that. It trimmed 432 more positions than Walker’s original budget plan. Ultimately, the budget eliminates 16 jobs total from all funding sources compared to the 2015-17 spending plan, but to get there it cuts 175 positions from General Purpose Revenue (GPR) and moves 498 state posts to Program Revenue-funded positions. That’s important. GPR is drawn from the general tax base, reliant on taxpayers. Program Revenue is funded specifically by those who use a particular government service. And we would be remiss if we didn’t remind taxpayers just how truly spoiled we are today here in Wisconsin. It wasn’t that long ago that we, as taxpayers, were constantly under siege from Madison, bombarded with one new tax after another, followed by another tax increase. At times we may be frustrated with some of the ideas coming out of Madison, but we must remember how much better taxpayers have it today compared to just seven years ago. So we need to take a second to celebrate the fact that, once again, Gov. Walker kept his pledge to not raise taxes. No individual income tax increase, no corporate tax increase, no sales tax increase. No gas tax increase or general vehicle registration fee increase. Another statewide property tax freeze on top of all that to boot. Thank you, Gov. Walker. And thank you, Republican-controlled Legislature for trimming nearly a half-billion dollars out of the original budget proposal. That is NOT to say that this is a perfect budget. Far from it. The spending increase in this budget is too big. Next time, we hope the governor and legislators will put the time and effort into writing a state budget that fundamentally reorganizes state government, shrinks the footprint of the bureaucracy and actually spends less of our taxpayer money to provide only the vital services everyone needs. We can’t help but feel that the $636 million increase in state aid to K-12 education was a missed opportunity to drive further reform of our education system and push our schools to do a better job of educating all of our children. It is morally reprehensible that we allow more than 52,000 children to be trapped in failing schools and that we would choose to give failing educrats a reprieve rather than give the students stuck in bad schools immediate access to a school of their choosing. Thankfully, the governor made this budget significantly better with the use of his veto pen. Gone is the troublesome language that would have given the tyrannical power of eminent domain to the non-elected quasi-government agency called the Public Finance Authority. Gone is the new bureaucracy at the Transportation Projects Commission. Gone is the unnecessary prevailing wage repeal start date delay, so taxpayers will soon begin to see significantly lower costs for government building projects. Also gone is $2.5 million to once again study and pursue tolling for our road system. Enough with the studies. If you think tolling is the right thing to do and the answer to our so-called transportation funding problems, introduce a bill and vote on the idea. Everyone knows what tolling is, no need to waste more money analyzing the concept. Technically due on July 1 (the beginning of the state fiscal year), Walker made it official and signed the budget document on September 21st. Walker rolled out his budget blueprint in February, heralding a budget plan built on the “Reform Dividend.” Six-and-a-half years of “common sense conservative reforms,” the governor said, have cleaned up the fiscal mess Republicans inherited in 2011, put the state back on the path to prosperity, and eased the tax burden on overtaxed Wisconsinites. So Walker tapped into those dividends in laying out his $76.1 billion spending plan, $34.5 billion of that from General Purpose Revenue (GPR). That was an increase of 2.6 percent (base year doubled) and 1.3 percent (base spending) over the 2015-17 budget. The governor’s proposal called for $37.5 billion in spending in 2018 and $38.6 billion in 2019, including GPR, federal revenue, segregated funds and program revenue. While mostly warmly received by Republican lawmakers, some fiscal hawks expressed concerns about the increased spending in Walker’s plan: $375 million in the first year, and $1.18 billion in the second year. Using Madison math, or the base year doubled method, that equates to a 2.6 percent increase compared to the last budget. The 12-member Republican majority on the Joint Finance Committee approved an education spending plan that would have spent $639 million over the base, just $9 million less than what Walker had sought. Democrats said the massive increase wasn’t enough, but the final product boosts per pupil aid by $200 in the first year of the budget and $204 in the final year. In the end, the final budget increases state aids by over $636 million compared to current spending. 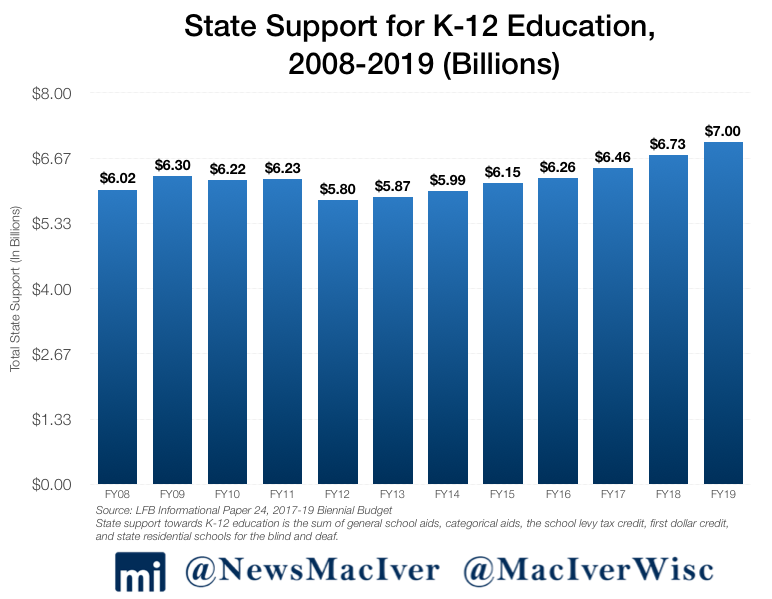 At more than $11.5 billion over two years, the K-12 budget represents the largest state education investment in actual dollars ever. Walker’s budget originally tied some of the additional per pupil aid to schools with the requirement that school districts certify compliance with Wisconsin’s Act 10. The governor’s proposal would have required districts to show that school employees are paying at least 12 percent of their health insurance costs and 6 percent of their public pensions. The Legislature removed the requirement, but school districts will have to report to the state the details of their employee health plans. That’s a big win for taxpayers. For the first time, the state will begin systematically tracking Act 10 savings. School choice picked up some big wins in this budget. The finance committee upped open parental choice program enrollment by increasing the eligibility level to 220 percent of the poverty level, or about $53,460 for a family of four. Including the public school open enrollment program, about 95,000 students participate in school choice in Wisconsin, with the majority in the southeastern corner of the state. The budget also removes barriers to the Special Needs Scholarship Program, a new program that allows children with special needs to participate in school choice. The spending plan increases the number of independent charter school authorizers – any UW chancellor and any technical college board will now be allowed to authorize new charter schools. More authorizers should translate to more charter school offerings, which is a victory for parents and students alike. Walker excised a big education expenditure with his veto pen. The Joint Finance Committee budget called for increases in local property tax funding for low-spending school districts through the low revenue adjustment. Once implemented, that could’ve raised statewide property taxes by up to $23.2 million. The districts have long argued that since property tax limits were implemented in 1993, they have been at a disadvantage because they are now locked into their low spending ways forever. Walker used his veto pen to remove legislative language that watered down his change to rules for school districts using the energy efficiency adjustment. This program, established in the 2009-11 budget, allows school districts to increase their revenue limits by the amount they spend on energy efficiency projects. The Milwaukee Journal Sentinel noted that this exemption, the only exemption to property tax controls, has allowed schools to spend over $200 million without voter approval. In February, Walker proposed changing the rules so that school districts would first need to hold a referendum if they wanted to spend over their revenue limits. GOP legislative leadership called the governor’s blueprint a good starting point, and then proceeded to tinker with and try to reshape the budget proposal, particularly on transportation. Most Assembly Republicans continue to be unhappy with the level of borrowing used to pay for our transportation needs. When Walker did not propose a gas tax increase or any new transportation funding streams in his budget, Assembly Republicans objected loudly. In stressing that every funding idea must be on the table in addressing Wisconsin’s disputed $1 billion transportation budget shortfall, Assembly Republicans backed gas tax increases and vehicle fee bumps to generate an enhanced and sustainable flow of revenue. The budget process ground to a halt for over two months. Let’s be clear. I don’t support spending less on K-12 education than what’s in my budget and I will veto a gas tax increase. In the end, the Joint Finance Committee approved $400 million in bonding, much closer to the original half-billion in borrowing the governor first proposed. The final bonding number got buy-in from a reluctant Assembly in large part because about $252 million of the money would go to the Interstate-94 north-south project, tied to the Foxconn Technology Group incentives package. Lest we forget, the budget was constructed amid a “once-in-a-century” economic development proposal, Foxconn’s plan for a $10 billion high-tech manufacturing campus in southeast Wisconsin projected to eventually create at least 13,000 family-supporting jobs. To the dismay of southeast Wisconsin lawmakers, the funding package includes no new money for Milwaukee area super projects, reconstruction of I-94 between the Marquette and Zoo interchanges and finishing off the north leg of the Zoo. Republicans on a party-line vote did away with what remained of Wisconsin’s Great Depression-era prevailing wage law. Finishing the unfinished business of the last session when the Legislature eliminated prevailing wage for all but state projects, the Joint Finance Committee has saved taxpayers from a system that artificially inflates wages on government building and highway projects. A previous study from the Wisconsin Taxpayers Alliance found that taxpayers could have saved as much as $300 million on construction projects in 2015 had the reforms been in place then. The budget also eliminates 252 Department of Transportation positions, a move that thins a bloated state agency that has wasted so much taxpayer money. When all was said and done, Walker won the great 2017 transportation battle, holding firm on no gas tax increases or general vehicle fee hikes. Despite the ever-escalating cost of healthcare in this country, taxpayers here in Wisconsin received some good news earlier this year. Actual Medical Assistance program expenditures during 2015-17 came in at $325 million less than what was included in the previous budget because of lower-than-expected enrollment. Fewer Wisconsinites on MA is a good thing. In a new round of reforms intended to help transition Medicaid recipients to employment and off government assistance, Walker’s Department of Health Services submitted a broad request to the federal Centers for Medicaid Services in June, asking the Trump administration for permission to implement a variety of reforms to the state’s Medicaid program – also known BadgerCare – including a drug screening requirement. If approved, it will allow Wisconsin to screen those who apply for BadgerCare for drugs and, if necessary, require participants to submit to a drug test. If a recipient fails, he or she would have to enter a state-funded treatment program. If they refuse, they would be ineligible for BadgerCare benefits until they agree to enter treatment. Walker has made welfare reform a priority throughout his tenure, and this state budget was no different. Pending final approval from the federal government, Wisconsin will become the first state in the nation to screen and drug test participants in the welfare-to-work program. Under this budget, the state will also expand work requirements for benefits programs to ensure that individuals receiving state benefits are building their own skills towards independence. Drug Testing MA recipients is not cruel as @SenTaylor stated; leaving them dependent on govt without assistance to get off drugs IS cruel. 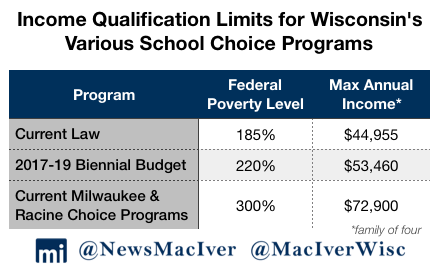 This budget also eliminates a significant benefits cliff in Wisconsin’s child care tax credit program that creates a disincentive for career growth. Under past law, if a recipient of Wisconsin Shares made just $1 more than the income limit, they would be automatically cut off from the program’s benefits. The budget reforms the program, creating a “ramp” to slowly reduce benefits over a certain point. Participants can now take gradual raises or promotions without the fear of losing child care benefits overnight if they make just a penny too much. That’s true reform, and it’ll make a positive impact on peoples’ lives. This budget eliminates a tax. Let that sink in. The Badger State, which has long worn the Scarlet T of a high-tax state, has eliminated the state property tax, also known as the forestry mill tax. Taxpayers will save $180.5 million over the next two years – not enough that anyone will be able to retire tomorrow, but the powerful symbolism cannot be denied. Kooyenga also celebrated the end of the Alternative Minimum Tax, a kind of separate income tax that is taking a bigger bite out of middle-income filers. While its impact is smaller, north of $7 million a year beginning in 2019, the principle is powerful: lawmakers really can wipe a tax off the books. An omnibus tax relief package authored by Kooyenga and Sen. Howard Marklein (R-Spring Green) takes a big bite out of Wisconsin’s antiquated and unfair personal property tax law. Small businesses have long had to pay local government a tax on the value of their equipment. The JFC bill exempts non-manufacturing machinery, tools and patterns from the property tax, unburdening business by a combined $74.4 million over the biennium. Democrats criticized the measure as ultimately drawing tax revenue away from local governments that will be forced to do the “same or more with less resources.” The partial repeal initiative, however, will be paid for through the creation of a state aid program administered by the state Department of Revenue. 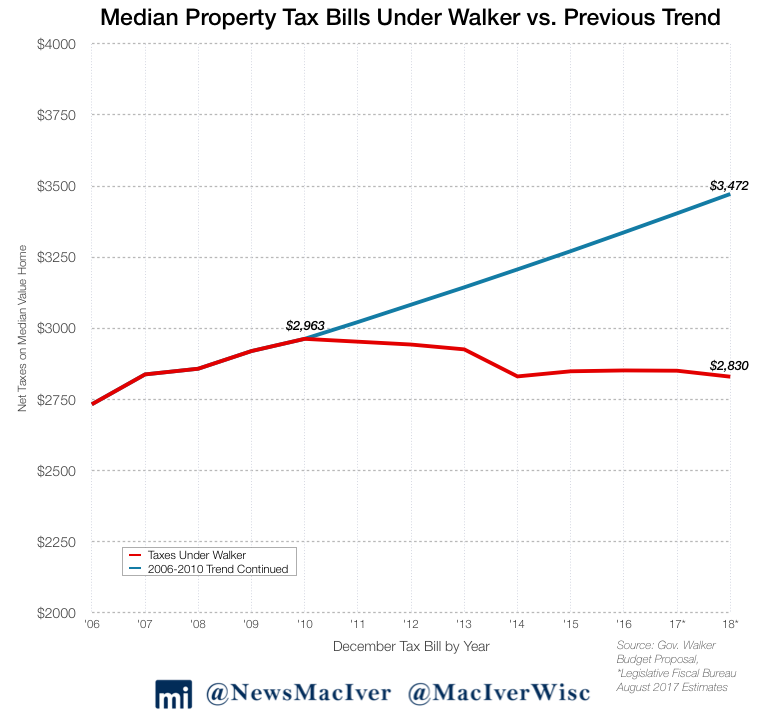 Property taxes, for another two years, are expected to be lower for the typical homeowner in Wisconsin than they were when the governor took office in 2010. That amounts to $3,000 in savings for the owner of a median-priced home in the Badger State compared to the trend prior to 2010, according to the Walker administration. 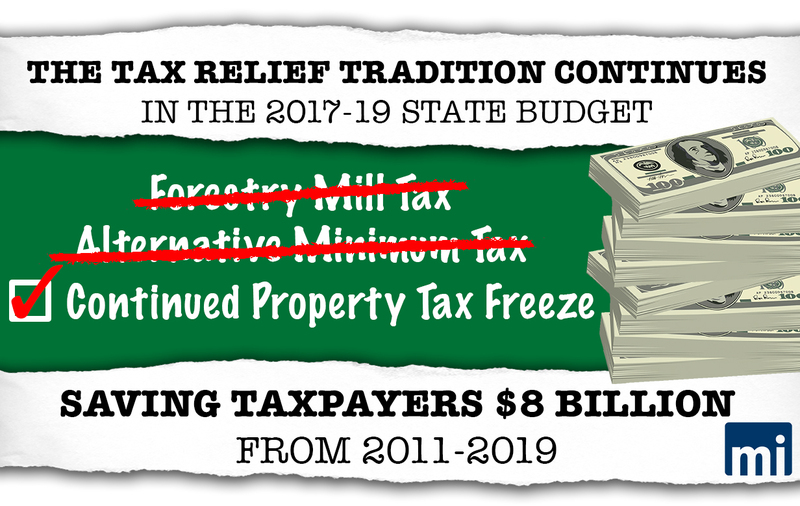 And by the end of the newly signed budget in 2019, Wisconsin taxpayers will have received some $8 billion in cumulative tax relief over Walker’s tenure in office. But small businesses’ gain, in part, was a loss to income taxpayers. Walker’s budget proposal called for $203 million in income tax cuts. He did so by reducing the lowest income tax bracket from 4 percent to 3.9 percent and the second-lowest bracket from 5.84 percent to 5.74 percent, while also widening the second-lowest bracket. The tax break would ultimately have benefited all Wisconsin taxpayers, who, regardless of income, pay those rates on at least a portion of their income. As budget negotiations progressed it became increasingly clear that income tax cuts would have to be sacrificed for other priorities, not the least of which was the personal property tax. The budget saves money for Wisconsin’s higher education students, too. It extends the University of Wisconsin System instate tuition freeze into its fifth and sixth years. Walker initially had proposed a 5 percent tuition cut, but the Legislature decided the $35 million price tag was too heavy. Instead, they put some of the money into need-based financial assistance. Walker’s 99 vetoes are expected to save taxpayers a combined $87.5 million over the next two budgets. More important, the governor removed some very unconservative provisions, many of which slipped into the budget at the last minute. Global Perspective – Is Wisconsin Heading In The Right Direction? Setting aside the specifics of the state budget for a second, we need to take a step back and ask whether Wisconsin is heading in the right direction. In May and June, Wisconsin’s unemployment rate hit levels not seen since the latter part of the roaring 1990s. At 3.1 percent, the state’s jobless rate was at its lowest level in 17 years. While it edged up slightly in July and August, Wisconsin’s unemployment rate was a full percentage point below the national number, which climbed to 4.4 percent. Wisconsin’s labor force participation rate continues to climb, at 68.8 percent in August. That’s nearly six percentage points above the U.S. rate of 62.9 percent. The Badger State’s unemployment numbers have dramatically improved in recent years, from a post-Great Recession peak of 9.2 percent in January 2010, the last year of Democrat Gov. Jim Doyle’s tenure. Initial Unemployment Insurance claims ended 2016 at their lowest level in 30 years, and all signs point to the same this year, according to data from the Wisconsin Department of Workforce Development. Continuing unemployment claims ended 2016 at their lowest level since 1973. While the jobless rate is an important gauge of the economy’s health, it is but one of many. And many of the leading economic indicators have continued to point up through Walker’s two terms in office. State agricultural exports rose nearly 9 percent in the first half of 2017, tallying $1.8 billion in products shipped to 134 countries, according to the Walker administration. Wisconsin businesses shipped a total of $11.2 billion in goods and services worldwide in the first six months of the year, an 8.2 percent increase over the same period in 2016. When Walker first took the oath of office in January 2011, he and the new Republican-controlled Legislature faced a $3.6 billion state budget shortfall. Through a series of limited-government reforms and much-needed fiscal restraint, the state’s financial health is in a much improved position. Instead of deficits, the Walker era has been a time of budget surpluses. The state’s Rainy Day Fund, or budget stabilization fund, stands at nearly $282 million, over 165 times larger than it was when Walker first took office. Rep. John Nygren (R-Marinette) and Sen. Alberta Darling (R-River Hills), co-chairs of the Legislature’s budget-writing committee, assert that conservative reforms in recent years have put the state in a strong fiscal position. Wisconsin’s fully funded public pension system helped push the state to the fourth best nationwide spot in overall long term debt obligations, according to a report last year by the Pew Charitable Trusts. About 4.8 percent of combined annual income earned by Wisconsinites would cover the obligations the state owes to creditors. Compare that to the national average of 14.8 percent, or in Illinois’ case, 31.7 percent. Last month, Moody’s upgraded Wisconsin’s long-term debt to its highest level since 1973. Wisconsin’s General Obligation rating is now Aa1 – the second highest rating, just below Aaa. “The bottom line is, that is good for every taxpayer because it means our financial house is in better shape, and it means long term, it actually costs us less to borrow,” Walker told MacIver News Service. A steadily growing economy, prudent budget management, and a fully funded pension system were key reasons for the upgrade. “The upgrade to Aa1 reflects the proven fiscal benefits of the state’s approach to granting and funding pension obligations when many other states are experiencing stress from rising costs and heavy liabilities; an economy that delivers steady but moderate growth; conservatively managed budgets; and adequate liquidity,” according to Moody’s report. Walker’s critics point to job creation numbers in the governor’s tenure, keying in on his pledge that Wisconsin’s economy would create 250,000 jobs in his first term in office. That didn’t happen, for a variety of reasons, not the least of which was the record slow rate of U.S. economic recovery from the recession late last decade. The bigger problem of late is not a lack of job opportunities, but the region-wide challenge of finding skilled workers. As Walker likes to say, Wisconsin is open for business. And businesses have taken note. Chief Executive magazine rates Wisconsin as a top 10 state to do business. Not long before Wisconsin’s conservative revolution in 2010, the nation’s top chief executives ranked Wisconsin as one of the worst states for business, a state laden with high taxes and stifling regulation. One Fortune 50 company in particular has taken notice. In late July, Walker joined President Trump, Speaker Paul Ryan (R-Janesville), and Sen. Ron Johnson (R-Oshkosh) for a White House announcement that Foxconn Technology Group planned a massive investment in southeast Wisconsin. The Taiwanese tech giant rolled out a proposal to build a Liquid Crystal Display production campus, a city unto itself, that would eventually create 13,000 manufacturing jobs paying on average $53,000-plus per year. Officials say the $10 billion investment would spur 10,000 construction jobs and many thousands more spin-off jobs to serve this “once-in-a-century” economic development project. Wisconsin beat at least six other states bidding on the project, with the Legislature officially signing off on a $3 billion incentives package this month. Foxconn expects to break ground in spring. “This is a truly transformational step for our state, our people and our economy, and Wisconsin is ready,” Walker said in signing the Foxconn legislation. This is a good budget. In the main, it’s good for conservatives. It’s good for taxpayers. It’s good for Wisconsin. Property taxes, on a median home value basis, are lower. Two taxes are gone altogether. The burden of government has been lifted in part off the backs of businesses and taxpayers. By the measures of limiting government and making life better for the Wisconsin taxpayer, this budget gets the job done. In February, Walker proposed a generous K-12 funding plan that would have sent $649 million more than base-level funding to the Department of Public Instruction (DPI). Over the summer, proposals from the Assembly and the Senate Republican caucuses kept the conversation going. The JFC Democrats also threw their hats in the ring with a plan that would have spent nearly $730 million more than Walker’s proposal, earning comparisons to “kids at Christmas.” JFC agreed to spend $639.3 million more than current funding, finding areas of compromise throughout the plan. After Walker’s vetoes, that overall spending went down a hair to $636 million. The budget committee kept Walker’s levels of per pupil categorical aid, totaling $507.8 million in funding, which was the bulk of the increase. Per pupil categorical aid is sent to nearly all schools, provided certain requirements are met. Funding levels will increase by $200 per pupil in 2017, and by another $204 in 2018. When all is said and done, the total per pupil aid from this program alone will be $654 per pupil. Walker’s original proposal tied some of the increased funding to compliance with Act 10, the 2011 law that reformed public sector collective bargaining in Wisconsin. The governor’s plan would have required school districts to certify to the state that employees are paying at least 6 percent toward pension plans and at least 12 percent toward healthcare plans. The final budget waters that plan down, instead requiring school districts to annually report employee contribution levels to the Department of Administration. While some will certainly be disappointed that compliance will not be linked to additional state aid, the reporting requirement is still significant. The state will, for the first time, have a clearer picture of the amount of money that Act 10 has saved taxpayers. Taxpayers and parents will also see heightened transparency thanks to new additions to annual school report cards. Schools will begin reporting data on how many students participate in AP classes, early college credits, and apprenticeships, among other important information. One area where the budget committee was more reform-minded than Walker: school choice. JFC’s budget increases the statewide income limits to 220 percent of the federal poverty level, up from 185 percent. Families of four earning just under $54,000 will now be able to apply, and an estimated 550 more students will now be able participate in the statewide program. Walker had proposed keeping the income limit at 185 percent, and school choice advocates fought for an increase to 300 percent, the same limit as the Milwaukee and Racine programs. The finance committee also removed barriers to the Special Needs Scholarship Program, a new program that allows children with special needs to receive scholarships and participate in schoolchoice. Students will no longer need to have been denied from public school open enrollment before applying, nor will they need to have attended a public school in Wisconsin for the entire previous year. Together, those changes are expected to increase enrollment by about 250 kids, effectively doubling the size of the program. Other changes to choice and charter schools include an increase in the number of independent charter school authorizers. Any UW chancellor and any technical college board will be allowed to authorize new charter schools. For the first time, charters will be allowed to open anywhere in the state – not just in Madison or Milwaukee. That’s good news, and will hopefully provide more options for the 50,000+ students currently trapped in failing public schools. Charter schools will be able to seek reimbursement for summer school costs, and parental choice schools see a funding “fix” allowing them to pro-rate reimbursements. Public school open enrollment will see a reimbursement increase of $100 more per pupil. The plan makes changes to the Opportunity Schools Partnership Program (OSPP) established in the last budget. Those changes were written with an eye on Racine Unified School District (RUSD), which was designated as failing on last year’s report cards. Without a change in law, if November’s new report cards again find RUSD to be failing, OSPP would go into effect – allowing certain schools to become part of a special turnaround district. RUSD gets 120 days to demonstrate Act 10 compliance to DOA. If RUSD meets compliance and is indeed declared failing in November’s data release, the district will get a year-long “pass” before OSPP’s requirements go into effect. The villages within RUSD will also get the option to hold a referendum on whether or not to split off and become a new school district. JFC’s budget plan includes funding to study the idea of creating a new school district. Property tax payers faced some potentially bad news through a change in a policy called low revenue adjustment. This would have allowed “low spending districts” to raise property taxes to bring their spending up closer to the state average without going to referendum. The issue was particularly important to the Assembly, which proposed allowing some districts to raise property taxes by up to $92.2 million statewide. The Senate followed suit with a scaled-back version that increased the adjustment more slowly. The budget committee adopted the same plan. The issue of revenue limits has long been a priority for school officials. When the limits were set in 1993, frugal districts were locked into low rates. According to proponents of the plans to increase the low revenue adjustment, those districts have since struggled to provide equitable services for their students. In the Senate and final JFC plan, certain school districts would have been able to raise property taxes by up to $23.2 million statewide. On the flip side, the budget also allocates $87 million more in each year to the school levy tax credit, which acts as property tax relief for homeowners. Walker vetoed the low revenue adjustment changes, citing potential property tax increases. Also included in JFC’s education budget is $9.2 million for laptops for high school freshmen, regardless of family income. We would have hoped that the committee could have found a better way to spend our money or cut spending, but alas. The new entitlement program will begin in the 2018-19 school year, and school districts will have to match $125 per device to receive money. The budget makes changes to teacher licensure, creating “lifetime licenses” for teachers who successfully complete six semesters. School district referenda are also limited to regularly-scheduled election years. Other changes to K-12 funding would have increased incentives for school districts to commit to shared services and whole-grade sharing, but Walker vetoed both new appropriations, reducing the final spending by $2.75 million. Mental health services and transportation funds will receive greater investments, as well. Sparsity aid, meant for rural districts, is expanded to allow more districts to receive funding. While Walker’s plan would have increased per pupil funding and created another level of sparsity aid, JFC’s plan allows districts to receive 50 percent of the prior year’s award if they grow too big to receive aid under that program. Walker also used his veto pen to restore his original proposals for the energy efficiency program. In his original budget proposal, Walker had recommended altering rules for school districts using the energy efficiency adjustment. This program, established in the 2009-11 budget, allows school districts to increase their revenue limits by the amount they spend on energy efficiency projects. Since 2009, school districts have spent more than $217 million using the adjustment, according to a Journal Sentinel report. In February, Walker proposed changing those rules so that school districts would no longer be able to spend over their revenue limits without first holding a referendum. Walker’s veto restores his original proposal. While UW-System reforms proposed by Walker were mostly watered down by JFC, the state’s higher education system still see an increase in state dollars in this budget. 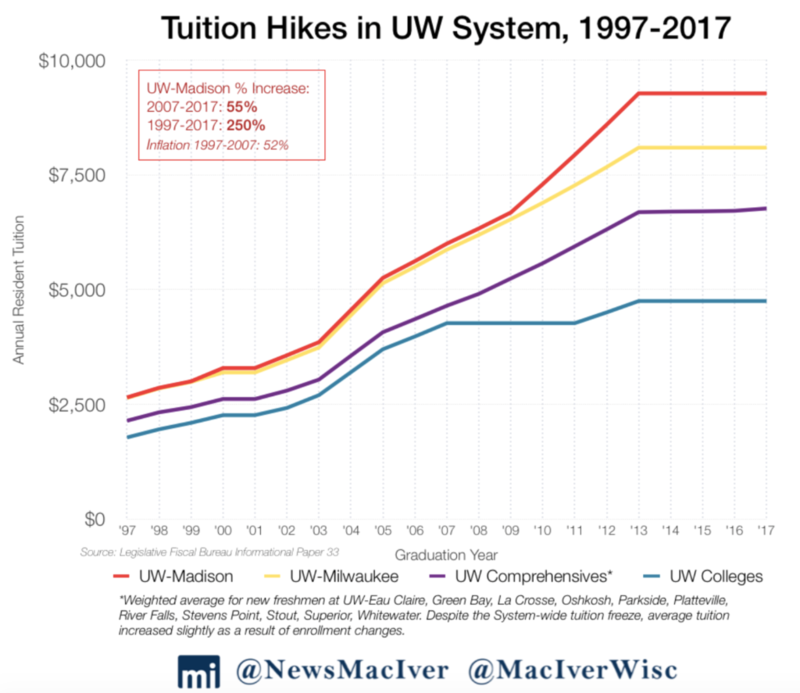 Rather than a $77 million increase as Walker had proposed, the UW will see a nearly-$30 million increase in GPR and a continuation of the in-state tuition freeze that students have enjoyed since 2013. 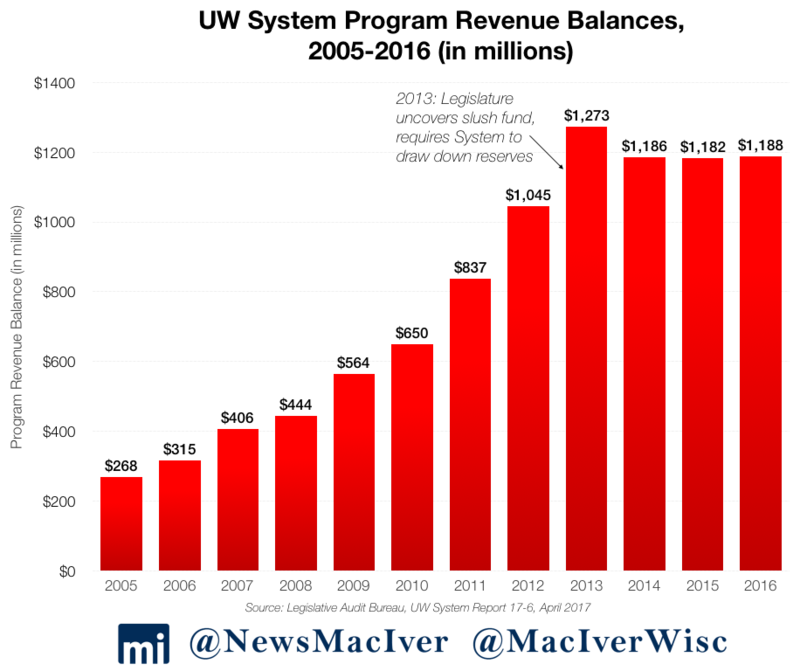 Current law also ends an old provision that would have the UW lapse money back into the general fund, effectively giving the system $50 million more in spendable cash this biennium. 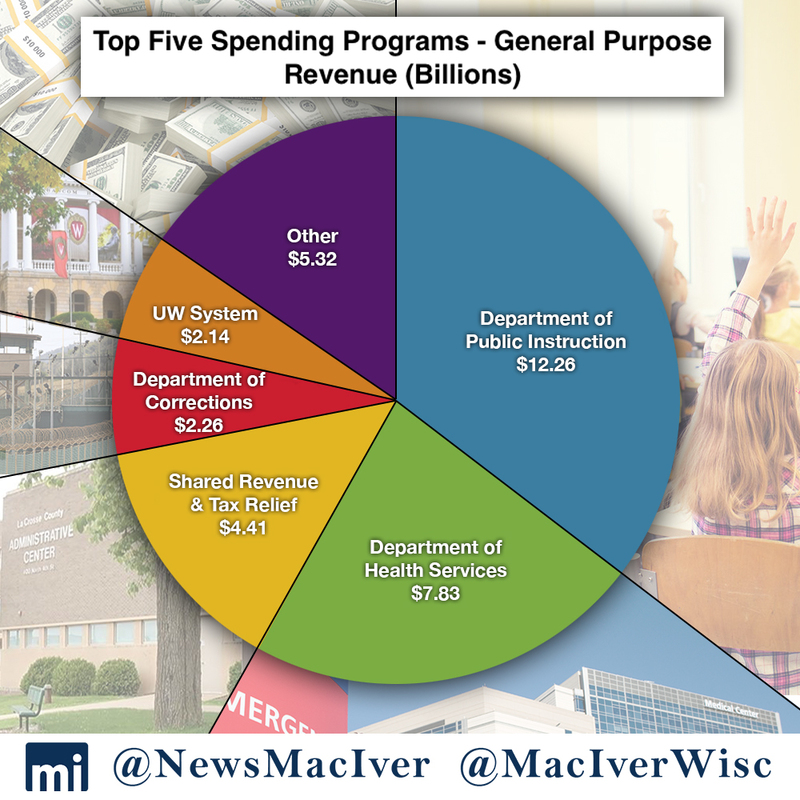 As a result, the UW will see an increase of more than $100 million compared to the last budget, primarily made up of performance-based funding, the Innovation Fund, and employee raises. Walker had proposed cutting tuition by 5 percent, but the committee balked at the idea, which proved to be contentious within the Legislature. Students still win with the plan, enjoying their fifth and sixth years of tuition flat tuition rates. Instead of spending $35 million on the tuition cut alone, JFC will send the money toward other initiatives, including need-based financial aid, a new engineering campus at UW-Green Bay, and $3 million for the Tommy G. Thompson Center at UW-Madison. 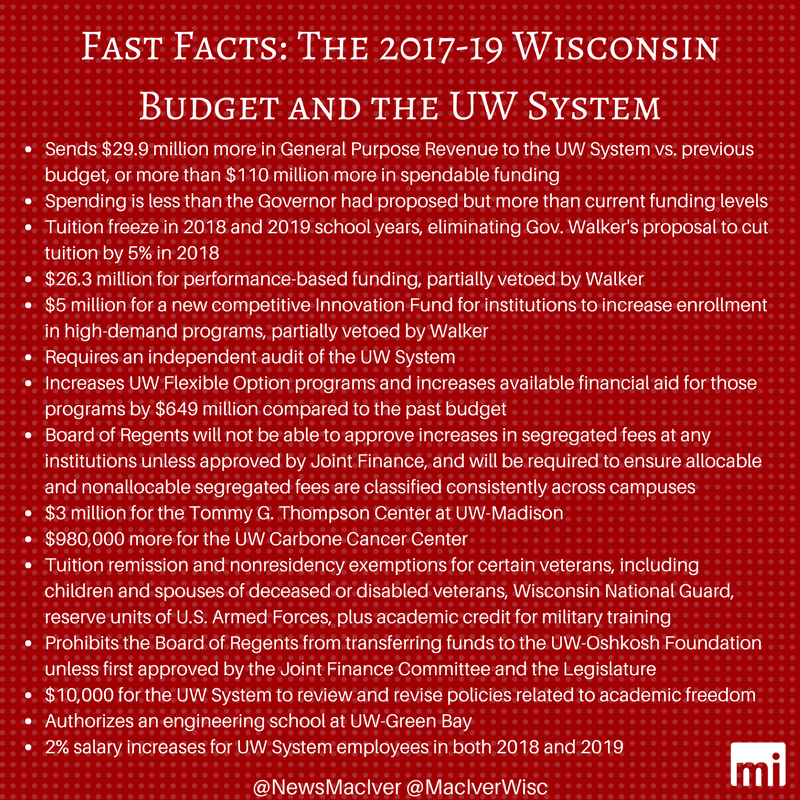 Some of the governor’s more innovative new proposals for UW were part of a group of items that JFC tossed out of the budget as “non-fiscal policy items” in March. Most notably, one provision would have required UW institutions to create pathways to three-year degrees for 10 percent of undergraduate programs by 2018 and for 60 percent of programs by 2020. That was an innovative idea and could have helped students get through college faster. At the very least, it could have showed that undergraduate degrees don’t need to take four (or more) years to complete. We hope to see the idea come up again. The budget committee also scaled back Walker’s performance-based funding plan, sending $25.3 million instead of $42.5 million – but Walker’s veto pen again adjusted that plan. Rather than let UW institutions choose their own metrics by which to be judged, Walker’s veto appears to give that power back to the Board of Regents. Another area of reform that JFC cut back was a Walker plan to let students opt out of paying certain segregated fees. Instead, JFC put in a plan that would standardize different kinds of segregated fees across campuses and would not let any board increase fees without the budget committee’s approval. In the all-important area of taxpayer transparency, the budget requires an independent audit of the entire system in 2017 and 2018, a landmark feat. The Board of Regents will be prohibited from transferring funds to the UW-Oshkosh Foundation without explicit approval from JFC and the full Legislature, following a scandal in which administrators funneled millions of dollars into the financially-troubled foundation. Also along the lines of transparency, the final budget includes Walker’s plan to begin tracking and reporting UW faculty workloads. Under the budget, the Board of Regents is charged with creating a system to monitor the workloads of faculty and instructional academic staff. Those who teach more than the standard academic amount will be rewarded. All of the data on teaching hours will be made public, offering greater accountability for taxpayers. A new competitive campus Innovation Fund and the UW Carbone Cancer Center both see significant investments in the budget, though Walker’s veto slightly changed the rules for the Innovation Fund. The plan also creates tuition remission and non-residency exemptions for veterans and certain family members, granting them in-state tuition as well as credit for military training. The budget allocates $10 million for the UW System to review and refine campus academic freedom policies. That proposal was included in Walker’s original budget blueprint, and similar bills have been championed by legislative leaders including Assembly Speaker Robin Vos. Walker’s plan would have required all UW campuses to publish one-page “performance funding report cards” at the end of each semester. Those report cards would describe how each institute fared on performance measures laid out by the state, including affordability and attainability, work readiness, and others. JFC changed that proposal, instead requiring the Board of Regents to publish an annual report describing how performance-based funding was distributed that year, and why. Each campus will have to post the report on their websites, but this change is still a far cry from the transparency Walker had proposed. Many of Walker’s strongest ideas for the UW System budget were non-fiscal policy items that were tossed out by JFC early on in the process. One included greater credit transferability and a new credit transfer report. Another would have required all undergraduate students to obtain a job or internship before graduating. Our education analyst wrote on that issue here. Perhaps needless to say, we think students are more than capable of realizing the value of work without the government forcing them to do so. While every Democrat on the finance committee voted against the final UW System package – deriding it as “not enough” for higher education – UW officials celebrated the plan and thanked the committee. Later in the summer, officials testifying at a hearing on the Foxconn incentives package called for an even greater investment in UW both in the near future and perhaps still in this current budget. Foxconn CEO Terry Gou has shown a strong interest in cancer research, sparking hopes for a potential future partnership between the parties. In the end, the Joint Finance Committee approved $400 million in bonding, much closer to the original half-billion in borrowing the governor first proposed. The final bonding number got buy-in from a reluctant Assembly in large part because about $252 million of the money would go to the Interstate-94 north-south project, tied to the Foxconn Technology Group incentives package. Lest we forget, the budget was constructed amid a “once-in-a-century” economic development proposal, Foxconn’s plan for a $10 billion high-tech manufacturing campus in southeast Wisconsin projected to eventually create 13,000 family-supporting jobs. To the dismay of southeast Wisconsin lawmakers, the funding package includes no new money for Milwaukee area megaprojects, reconstruction of I-94 between the Marquette and Zoo interchanges and finishing off the north leg of the Zoo. Republicans on a party-line vote did away with what remained of Wisconsin’s Great Depression-era prevailing wage law. Finishing the unfinished business of the last session when the Legislature eliminated prevailing wage for all but state projects, the Joint Finance Committee has saved taxpayers from a system that artificially inflates wages on government building and highway projects. A previous study from the Wisconsin Taxpayers Alliance found that taxpayers could have saved as much as $300 million construction projects in 2015 had the reforms been in place then. Health care is perhaps the most challenging policy area for Wisconsin’s lawmakers. Like any government entitlement, Wisconsin’s health care programs for the poor are complicated and expensive. 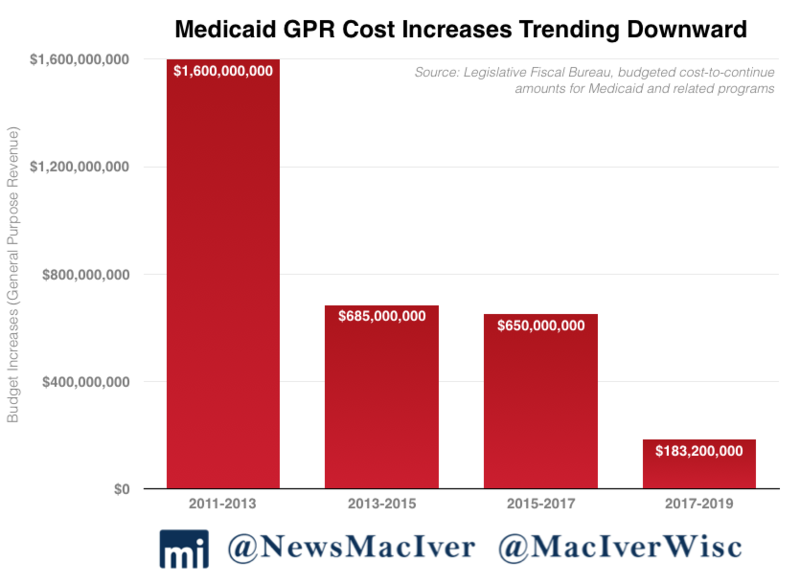 An extra $182.3 million of precious GPR had to be added to the state’s Medical Assistance (MA) budget – composed mostly of the entitlement juggernaut Medicaid – just to keep up with projected costs of existing programs and services over the 2017-19 biennium. Importantly, actual MA program expenditures over 2015-17 came in at $325 million less than what was included in the previous budget due to lower-than-expected enrollment. 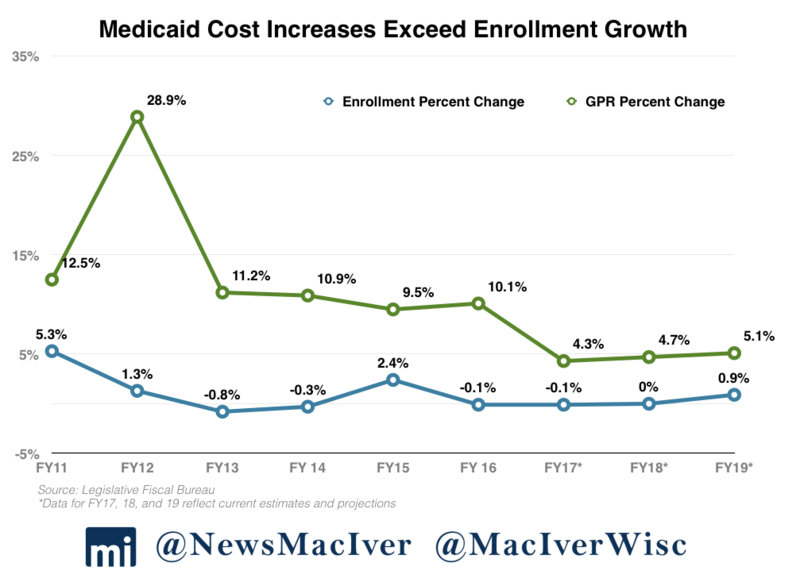 While the cost of Medicaid, MA’s largest program, continues increasing, the rate of increase has slowed during the Walker years. 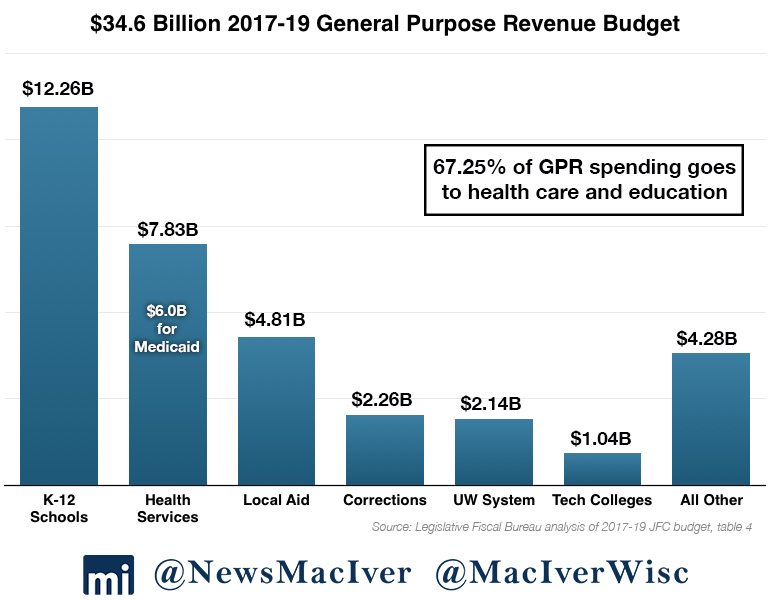 The previous three biennial budgets increased GPR spending on Medicaid by $1.6 billion, $685 million, and $650 million just to maintain services, respectively. The 2017-19 budget spends a total of just over $20 billion on the state’s MA program. Of that total, $6.1 billion is GPR spending – a 2.3 percent increase in the first year of the budget and a 6.6 percent increase in the second year. Total enrollment in all MA programs is projected to increase by 1,969 in the budget’s first year and 9,979 in the second year. That means total MA enrollment by the end of the biennium would reach 1,129,144. For the state’s SeniorCare program, the budget increases total spending by about $900,000, but reduces GPR spending by $5.1 million. This is a significant departure from the governor’s recommendation to increase spending by $54 million, but was possible because the projected costs of providing SeniorCare benefits in the 2017-19 biennium were significantly reduced. The budget also increases nursing home funding by $48.8 million over the biennium – $20 million of that coming from GPR funds. Childrens’ long-term support services is also increased $39.3 million, with $16.3 million coming from GPR. In a new round of reforms intended to help transition Medicaid recipients towards employment and off of government assistance, Walker’s Department of Health Services (DHS) submitted a broad request to the federal Centers for Medicare and Medicaid Services (CMS) in June, asking the Trump administration for permission to implement a variety of reforms to the state’s Medicaid program – also known BadgerCare – including a drug screening requirement. The DHS also requested to establish a two-tier requirement for monthly premiums and copayments for emergency room visits. Childless adults with household incomes from 51 to 100 percent of the federal poverty level would have to pay $8 per month for their benefits and an additional $8 for each emergency department visit. Childless adults below 50 percent of the federal poverty level would not have to pay the nominal premiums or out-of-pocket copayments. The DHS request also seeks permission to implement work requirements in BadgerCare mirroring those successfully implemented in the state’s FoodShare program. Recipients would have to either work 80 hours per month or take part in job skills training. BadgerCare benefits would be limited to four years for anyone not meeting the work requirements under the request. Walker’s welfare-to-work initiatives make Wisconsin a welfare reform leader once again by making the Badger State the first state to require drug screening, and by trying to abolish the “benefits cliff” that causes BadgerCare recipients to lose all benefits when they make one dollar too much in income. By requiring recipients to pitch in for their coverage, the groundwork will be in place to turn the cliff into a ramp to encourage recipients to work more hours, take promotions, and advance their careers. The Department of Health Services is currently in negotiations with the CMS over the waiver requests. Much has been accomplished to reform health care in Wisconsin during Walker’s tenure, including an innovative BadgerCare plan implemented in 2013 that makes sure every Wisconsinite living at or below the poverty level has access to health care. As a result, Wisconsin has one of the highest rates of coverage in the country. However, lawmakers will need to continue their efforts to deal with the rising costs to taxpayers that spiraling health care costs and an aging population will inevitably bring. We hope that the drive for reform continues in future budgets. In his initial budget, Walker proposed changing the way the state insures its employees from a fully-insured model to a self-funded model, where the state would directly pay for the health insurance claims of state employees instead of farming out the business to a network of private companies around the state. The governor estimated the reform would save $60 million over the biennium, in part thanks to Obamacare’s complicated web of new health insurance taxes. In late May, Walker administration officials announced that revised estimates put the savings by switching to a self-insured model at $103 million over the 2017-19 budget. Joint Finance co-chairs Sen. Alberta Darling (R-River Hills) and Rep. John Nygren (R-Marinette) weren’t interested in the self-insurance switch, a position they made clear early in the budget process. The committee rejected the idea in a meeting shortly before budget talks collapsed in June. Instead, Joint Finance directed the state’s Group Insurance Board (GIB) to find equivalent savings within the current system. In late July, the GIB came through, announcing a zero percent increase in premiums for state employees for 2018. But that came at the cost of two major insurers, Humana and UnitedHealth, which announced plans to withdraw from the state’s health insurance program in 2018. The zero percent increase negotiated by the GIB is undoubtedly good news for taxpayers. It will save taxpayers $15.4 million in the first year of the budget and $23 million in the second year. Governor Walker vetoed budget language that would’ve launched an audit of GIB’s reserve funding, as well as an attempt by Joint Finance to require the GIB to make regular reports directly to the committee. “I do not believe that [JFC] should micromanage plan design, contract negotiations and the financial and programmatic management of the program,” Walker wrote in his veto message. Walker also vetoed a JFC measure that would’ve increased the number of plan tiers available to state employees from three to five. The experts at the GIB have demonstrated for 58 years that they can handle their own affairs, Walker said. While the GIB managed to hold the line on insurance increases for state employees, many questions remain. If a zero percent increase for state employees is possible amid skyrocketing premiums for everyone else, how much padding are taxpayers providing for the bottom lines of these private insurance companies? How is it possible that government workers can enjoy no increase in their premiums while the general public is projected to endure rate increases of 12 percent or more next year? The state pays out about $1.4 billion annually in premiums for its 250,000 employees and their dependents. That astounding figure means that the way the state provides health insurance for state employees is a prime opportunity to save taxpayers some substantial cash. While JFC did a good job of saving taxpayer money this time around, we hope the debate over self-insurance is renewed in the next budget cycle. Welfare reform – which Walker has prioritized throughout his tenure – found its own place within the state budget, as well. JFC agreed to take up Walker’s proposal to begin drug testing participants in the state’s welfare-to-work program. Wisconsin will become the first state in the nation to do so. The state will also begin requiring able-bodied adults with children over the age of six to seek job training in order to receive FoodShare benefits. Eligible training plans include the state’s Foodshare Employment Training program, also known as FSET. This summer, the administration released a new report summarizing Year 2 of the FSET program. The report itself focuses on FSET’s success stories – these are real people with real struggles, working to get on their own feet and move away from government dependence. Besides quotes from participants that really ground the program, such as the effervescent, “I’m finally doing what I love and it makes me so happy,” the hard data shows solid results. Individuals who stick with the program tend to receive wages well above the minimum wage of $7.25 per hour. Monthly average wages and weekly hours have also slowly grown over time. As the administration released its “Year 2” report focusing on success stories and the growth of the program, a new dataset was not far behind. 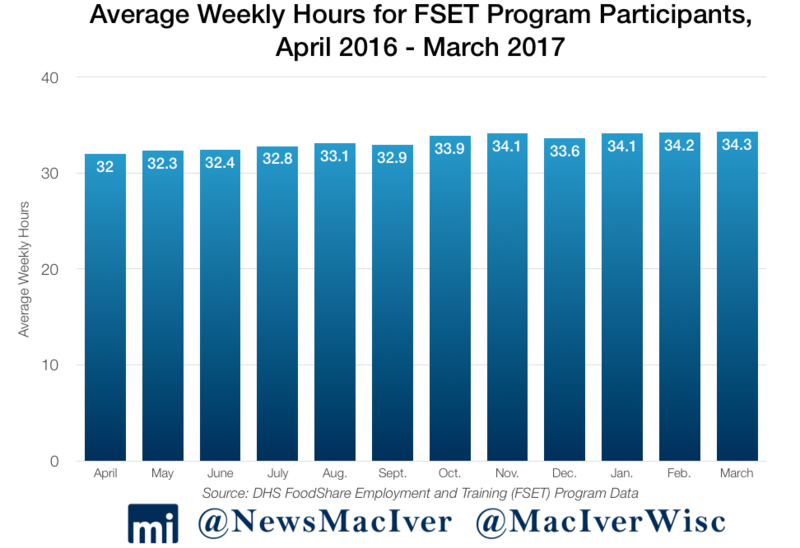 FSET participants through June of 2017 made, on average, higher wages and worked more hours than just months prior. In eight of 11 FSET regions, wages had increased between April-June of 2016 and the same quarter one year later. The state will also create a $25,000 liquid asset limit for those who would want to participate in FoodShare, ensuring that the program is not used by those who may not need the state’s help. Another reform will expunge unused balances on inactive accounts. Walker’s plan to eliminate the so-called “benefits cliff” in the Wisconsin Shares child care subsidy program received unanimous approval from the committee and proved to be one of the most popular ideas in the governor’s budget. The cliff automatically cuts off child care subsidies for families with incomes over 200 percent of the federal poverty level. Joint Finance Committee Co-Chair Sen. Alberta Darling, (R-River HIlls) said the current setup is a disincentive to breaking the welfare chains. Walker’s plan provides a sliding scale, allowing child care program participants to receive $1 for every $3 earned in excess of the eligibility limit. Benefits end once income hits 85 percent of the state’s median income. The cost is projected at $4 million over two years, funded through federal cash. The governor had originally proposed reforming the homestead tax credit and earned income tax credit, but all of those changes were stripped out by the Legislature. The budget committee also passed a Walker initiative that would trim W-2 benefits for families of children who are habitually truant and who do not cooperate with case management services to improve attendance. Currently, state law cuts benefits for families of children not enrolled in school. In the final stages of the budget debate, JFC’s transportation budget included one very important item the committee had initially thrown out of Walker’s proposal: full prevailing wage repeal. Finally, the millstone of this antiquated law will be removed from the necks of taxpayers. While the prevailing wage was repealed for local projects in the last state budget, all state projects still must pay inflated wages based on arbitrary calculations under the (also antiquated) federal Davis-Bacon Act. How much will Wisconsin taxpayers save? 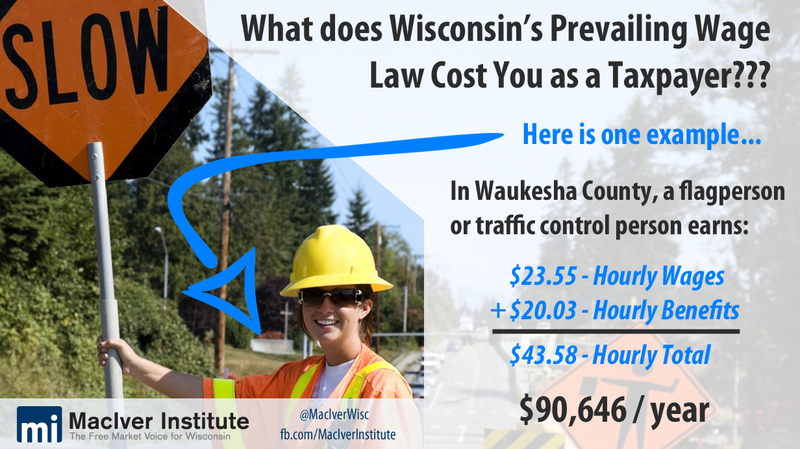 One study from the Wisconsin Taxpayers Alliance showed that Wisconsinites could have saved $200-$300 million on vertical construction projects alone in 2014 in the absence of prevailing wage. That estimate doesn’t even consider all other public construction that goes on in the state, including billions of dollars on road construction projects. Examples abound of cost overruns thanks to the prevailing wage law. One six-mile ATV trail in Vilas County was initially going to cost $30,000 per mile, but after prevailing wage was factored in, the price shot up to $55,000 per mile. In the Village of Grafton, an already-completed water tower maintenance project exploded in price from $597,000 to $861,000. Even though the project was already complete, local taxpayers had to come up with an extra $260,000. 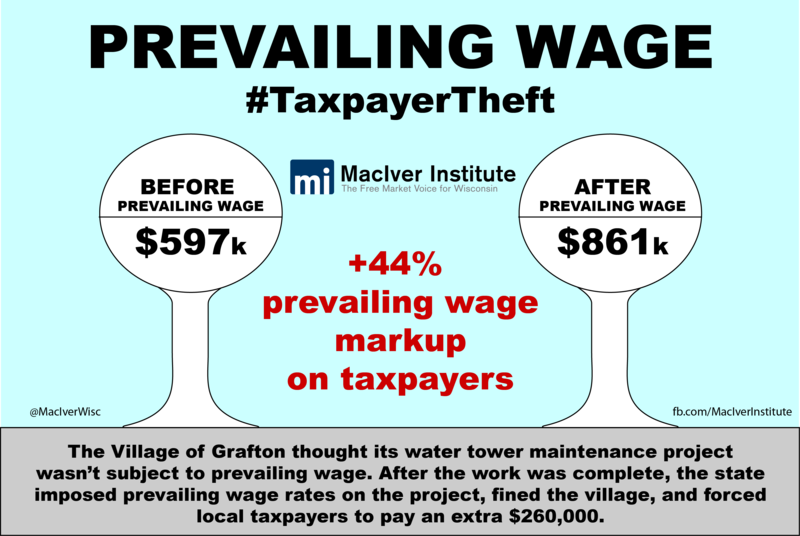 If prevailing wage was costing taxpayers so much extra money for local projects alone, imagine how much will be saved now that prevailing wage will finally be thrown into the circular file of old, outdated laws. In the years to come, taxpayers will no longer have to imagine. Thanks to last-minute negotiations between a set of conservative senators and the governor, the state prevailing wage was repealed as soon as the signed budget was published, rather than in September of 2018. Prevailing wage isn’t the only outdated policy that meddles with the private sector in Wisconsin. Did you know the state government offers property insurance to local units of government? Well, it does – but not for long. The state’s Local Government Property Insurance Fund (LGPIF) dates back to 1911 when private insurance was literally in the horse and buggy days and local governments couldn’t find the right insurance policies in the private market. Recognizing those days are long gone and the LGPIF isn’t needed anymore, the JFC budget calls for an end to the struggling program, an effort pushed by JFC Co-Chair Rep. John Nygren (R-Marinette). Gov. Walker proposed eliminating the fund in the last state budget, but the Legislature balked at the proposal. Considering that in today’s world you can buy insurance policies in just minutes, many local governments have since found insurance elsewhere. As a result, the fund has shrunk considerably and had been in danger of becoming a bigger and more expensive liability for all state taxpayers. The state still offers life insurance via the State Life Insurance Fund. Nygren has also called for an audit of this 116-year-old program. Maybe in the next budget, the state will also jettison this relic of days gone by and let the private sector take over. This budget also includes significant reform for referenda – in particular, those held by school districts. The occurrence of referenda has increased in recent years, with voters approving millions of dollars in spending and bonding. Now, referenda will be limited to primary and general election days. Final negotiations between a group of conservative senators and the governor resulted in this provision being strengthened even further, no longer allowing school district referenda to be held in Novembers of odd-numbered years. This change will go into effect on Jan. 1, 2018, to ensure that already-scheduled referenda for this fall are not affected. Off-cycle elections result in notoriously low voter turnout. With these reforms, a greater portion of each voting population is likely to weigh in on questions of massive spending. One overarching issue with the 2017-19 state budget that simply cannot be ignored is an increase in overall spending. 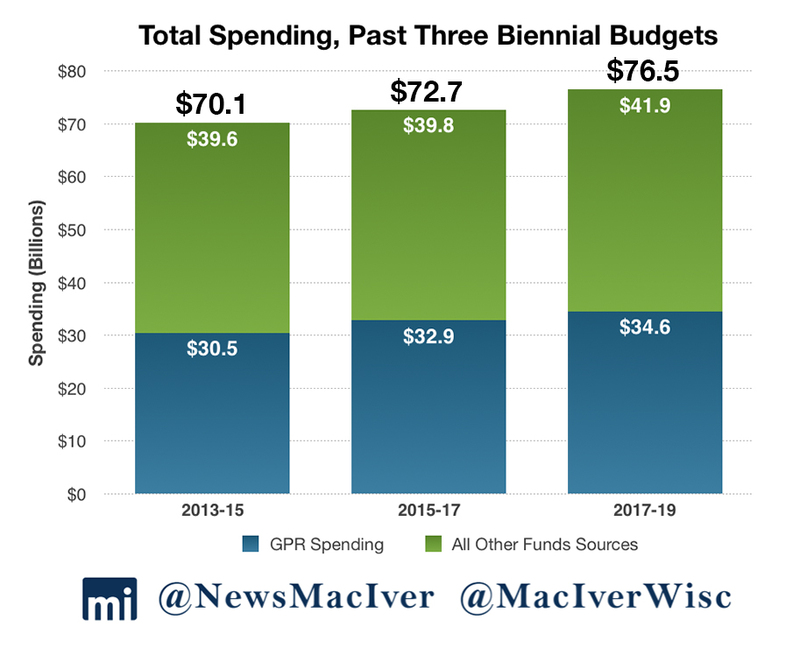 At $34.6 billion in GPR for the biennium, the budget spends nearly $1.30 billion more in GPR than the previous budget, or 3.89 percent. That continues a worrying trend of ever-growing government. The spending increase caused several legislators, including Sen. David Craig (R-Town of Vernon) and Rep. Adam Jarchow (R-Balsam Lake), to vote against the budget on the floor. Both lawmakers agreed that there were plenty of good reforms, but said that they simply couldn’t agree with its levels of spending. One major missed opportunity for taxpayer savings – switching to a self-insurance model for state employee healthcare plans – occurred early on in the budget process. Stating that there were too many questions, JFC’s co-chairs announced that they would reject the reform for now. Instead, the Group Insurance Board was directed to find savings within the current system. The Legislature also rejected Walker’s proposed income tax cuts, instead opting for a partial repeal of the personal property tax. Taxpayers, especially small business owners, will still win. However, any efforts toward gradually lowering and flattening Wisconsin’s progressive income tax code would be meaningful. In the last budget, a major scandal broke out when lawmakers made a last-minute attempt to overhaul the state’s open records law. That attempt came in the final motion of the budget – known as the “999” or “wrap-up” motion. Naturally, all eyes were on the final few motions this year. While there weren’t any radical policy overhauls this time, some concerning eleventh-hour additions did indeed make their way into the process. Perhaps most notably, changes to the shadowy Public Finance Authority included in a final JFC motion would have given it much more authority. The agency, which issues high-risk bonds on behalf of the state, would have been given the power of eminent domain. Just a week prior, the organization was largely unknown, even to legislators. One representative voted against the entire $76.5 billion document because of the PFA changes alone. Final negotiations between Walker and a handful of conservative senators resulted in a veto stripping the PFA’s proposed new powers. Even after the governor’s vetoes, unfortunately plenty of pork still made it through. The budget sets aside $100,000 for an Arts Center in Monroe, Wisconsin. It also allocates $900,000 to tobacco distributors for the tax stamp on packs of cigarettes. Back in February, Walker had proposed eliminating the Department of Natural Resources magazine, published six times a year. Instead, JFC cut back his proposal and agreed to publish the magazine four times a year. Publishing a magazine shouldn’t be a function of government, and the conservatives on the budget committee would have been better served going along with Walker’s plan and eliminating the magazine altogether. In a similar vein, the budget maintains the state’s Knowles-Nelson Stewardship program. Walker had proposed reforms to the program in the previous budget, but the Legislature decided to keep the program as-is, letting the state buy more public lands (and acquire more debt). One provision that made it through to the final budget requires users of Airbnb who rent out their home for more than ten nights a year to get a license from DATCP. Several new sales tax exemptions are created for various industries, including beekeeping. Those who enter competitive tournaments and leagues and submit fees for prize money will also see a sales tax exemption. And if you manufacture dairy products containing more than 50 percent yogurt, but sell it in a separate retail store, you’re also off the hook for paying the sales tax. Walker had also proposed creating a new back-to-school sales tax holiday in August. That could have helped middle class families save money on their school shopping, but the proposal was cut by JFC in favor of other reforms. Another reform that could help those middle-class shoppers: a repeal of the minimum markup. That reform wasn’t included in the budget either, a significant missed opportunity for taxpayers. 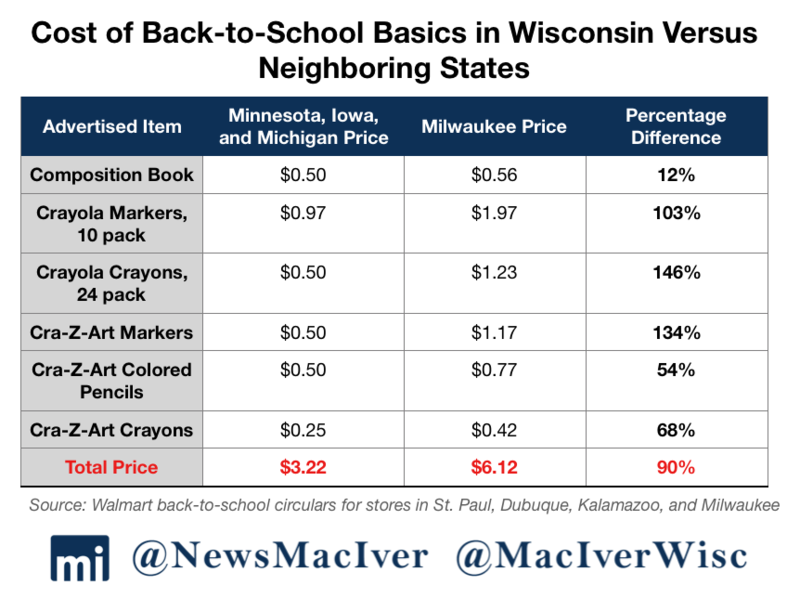 This back-to-school season alone, Wisconsin shoppers saw prices that were 12 to 146 percent higher than in neighboring states for the basics, like crayons and folders. Minimum markup repeal, or a sales tax holiday, would have helped. The realm of education had several missed opportunities. Walker’s plan for the UW to create more pathways for three-year undergraduate degrees would’ve helped break ground and create transparency for students, as would one-page report cards for each school in the system. Neither idea is included in the final document. While the Legislature rejected some of Walker’s education reforms, it added plenty of its own. The budget includes $9.2 million for laptops for high school freshmen, regardless of income, beginning in the 2018-19 school year. That’ll be a new entitlement moving forward, and we were surprised to see both houses of the Legislature include versions of the idea in differing education proposals. Finally, Walker’s proposed changes to the sparsity aid program were rejected. When districts grow too big to qualify for the aptly-named pot of money that is sparsity aid, school districts will be able to receive 50 percent of however much they received in the last year they qualified. That blurring of lines will likely grow spending in the program over time. As the smoke clears on the 2017 budget battle, the Republican-controlled Legislature is responsible for a two-year state spending plan that comes in at $76.5 billion, which includes $771 million in bonding. That’s $1.5 billion more than the 2015-17 budget. Bonding aside, this budget amounts to a 2.1 percent increase in spending. In the General Purpose Revenue (GPR) category – which is the precious state tax money that mainly comes from income taxes, sales taxes, and corporate taxes – this budget spends $34.6 billion, an increase of $1.3 billion compared with the 2015-17 budget, a 3.9 percent increase. The final budget, after the Joint Finance Committee made a number of changes to Walker’s original proposal, reduces overall state full-time equivalent positions (FTE) by a modest 16 positions. The spending plan reduces the number of positions funded by GPR by 175 FTEs and reduces segregated revenue-funded positions by 304, but it also adds nearly 500 positions funded through program revenue. Madison uses its own kind of math called “base-year doubled” to track its spending. Under the base-year doubled scenario, spending levels in the second year of a budget are doubled to measure the amount of increase in the next biennial budget. Base-year doubled makes spending increases look smaller than reality. 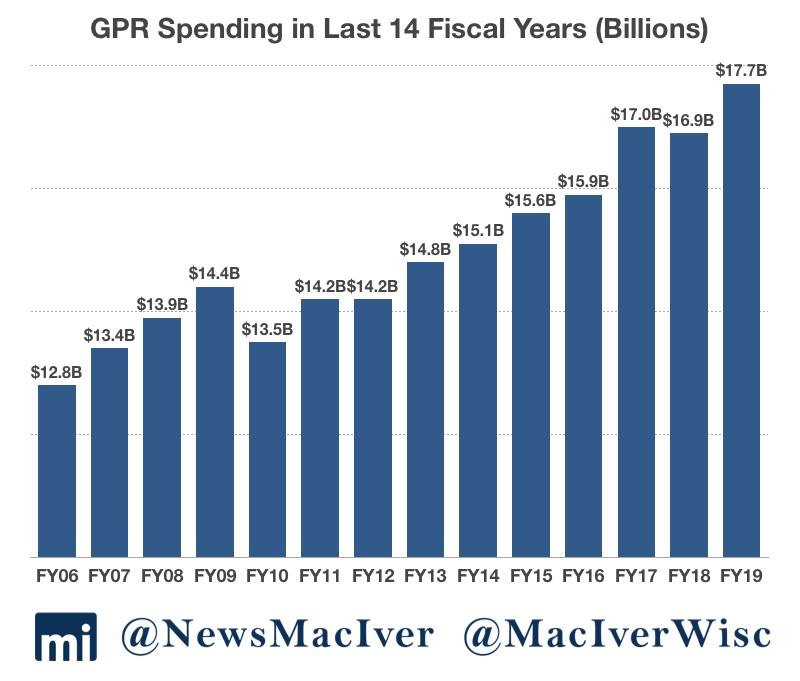 Here’s a look at overall spending and GPR spending in the last 14 years. 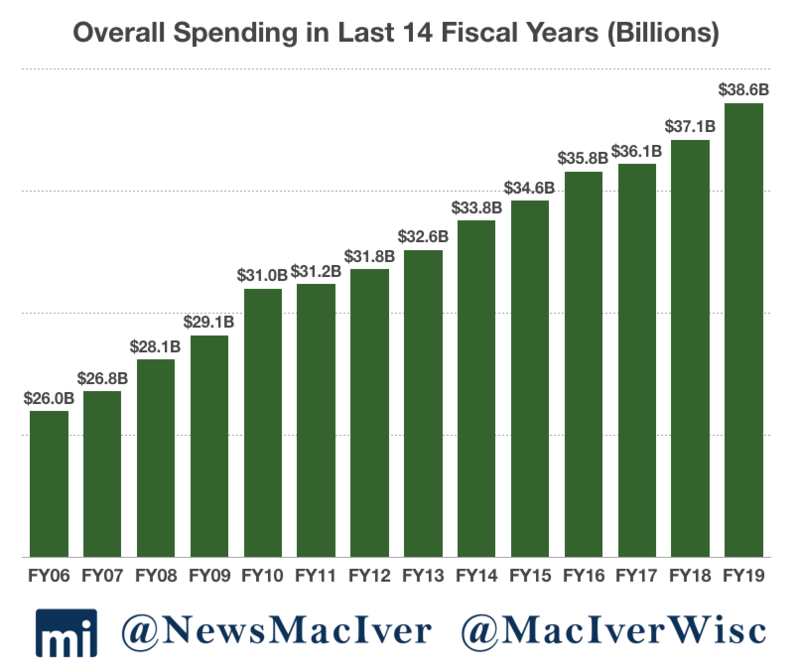 Even though Walker and the Legislature acted responsibly and passed a balanced budget that matches spending with revenues the state will take in over the next two years, it is disappointing to see such large increases in spending, particularly in the budget’s second year. During the next budget debate, that large increase in the 2019 fiscal year will be used as the base year, practically guaranteeing lawmakers will be pressured to increase spending even more. On the positive note, This budget eliminates two taxes. Let that sink in. Wisconsin, which had long worn the Scarlet T of a high-tax state, has eliminated the state property tax – also known as the Forestry Mill Tax – as well as the Alternative Minimum Tax (AMT). The budget also eliminates the Forestry Mill Tax, which “costs” $180 million in revenue over the next two years. The end of the tax will save the average homeowner $27 per year. Though the amount of the savings has been criticized as not enough, the powerful symbolism of deleting the last remaining portion of the state property tax cannot be denied. Kooyenga also took the lead in eliminating Wisconsin’s AMT, saving taxpayers $6.7 million per year. While the tax was intended as a “wealth tax” aimed at higher-income earners, Kooyenga said it has increasingly been hitting middle-income tax filers and added unnecessary complexity to the tax code. Until Gov. Walker’s signature officially did away with the AMT, Wisconsin was one of just six states with this second income tax. Standard income taxpayers won’t get a break this time around, however. Walker’s budget blueprint, released in February, called for nearly $600 million in income tax and fee reductions. But the Republican governor’s plan to ease income taxes by a combined $203 million was gobbled up by other priorities – not the least of which was Wisconsin’s disputed $1 billion transportation budget shortfall. The budget also reduces the state’s burdensome personal property tax, which forces businesses to pay an extra tax on property they’ve already bought. The budget exempts machinery, tools, and patterns, saving taxpayers $74 million. The budget lowers overall borrowing by nearly 28 percent compared to the last budget, appropriating $771 million that will mainly be used on transportation projects. That number is nearly $300 million less than the $1.1 million in overall bonding in the last budget. 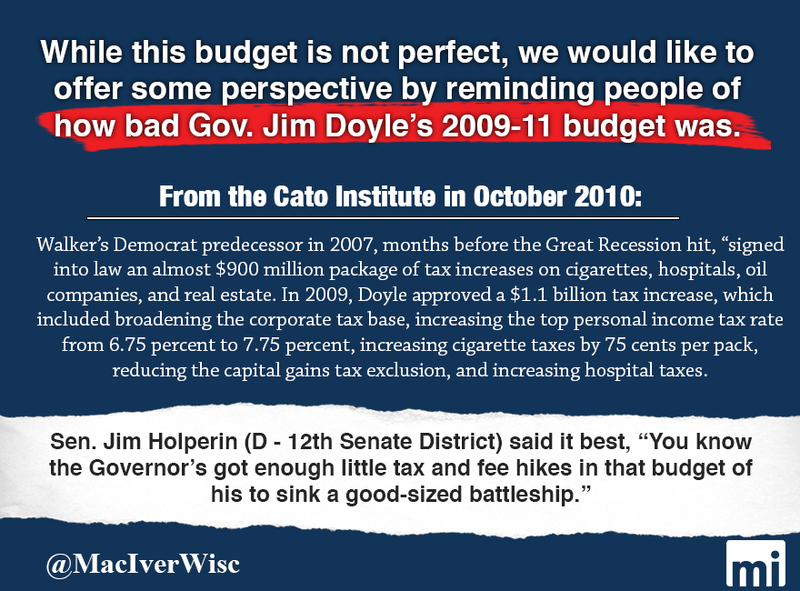 Walker has held the line on tax hikes in each of his previous three budgets, and his latest was no different. The Republican-controlled Legislature’s final bill cuts property taxes by $5 in the first year, and $29 in the second budget year on a median-valued home.